OK…finally a book on a wild and crazy guy, whose accomplishments are little noted or recognized. Why, you may ask , was it written? The tragic life-ending event for the Thompsons–murder–has somehow made all sort of folks want to quickly forget the man, his mechanical skills and his leadership abilities. But his life was worth chronicling, and Erik Arneson, an executive at SPEED channel, has done that. Arneson goes into a detailed discussion of the far out events in the world of what we know call “motorsports” that Mickey was part of. The story starts out with Mickey being self taught, his first racing on the dry lakes of the Mojave desert with hot rods. His engineering knowledge grew to the point where he was able to enter his own cars in the Indy 500 (albeit with disastrous results). His four-engine Pontiac Streamliner set a one-way speed record, his Indy cars were advanced enough to threaten the “good ol’ boys’ and he was forced to change them. His cars were a threat to the establishment. A.J. Foyt is specifically quoted as part of the threatened group. 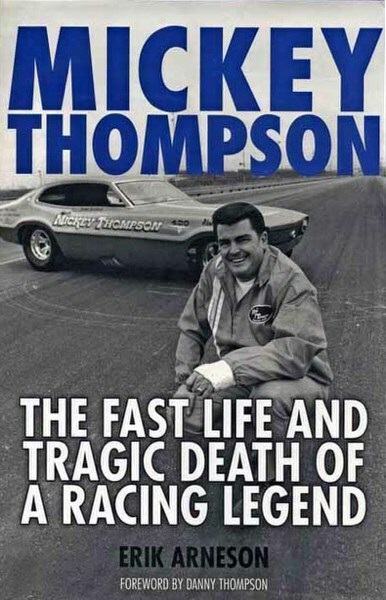 Change them, Thompson did, and his cars still qualified, which was no small accomplishment. The book contains many photos of his life…and the pictures and captions all help one to realize that he was one of a kind, an original, a man without a formal education that built machines that were competitive. This is something you couldn’t do today in the higher classes of motorsport. The murders of Thomson and his wife Trudy, and the subsequent conviction of his ex-business partner for the murders are well covered, even though the result of the whole matter makes one want to bury the memories. Human nature determined the over-riding finality of this extraordinary man. It’s a book worth reading.